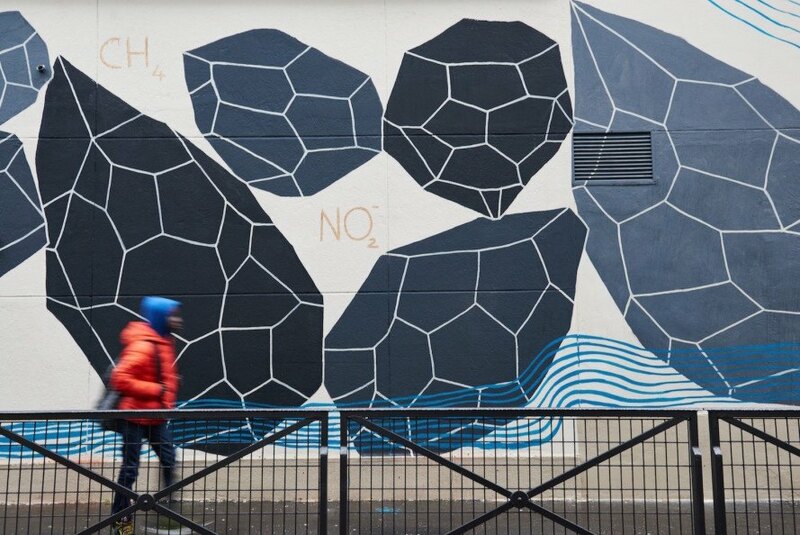 To welcome the upcoming Paris’ COP21 Climate Meeting, Italian artist Andreco is launching CLIMATE 01, an international art project comprising several public artworks about climate change. One of his designs is a large-scale mural that depicts his interpretation of man-made climate change and the alleged consequences. The art piece is painted on the facade of the Richomme Elementary School located in “La gout d’or,” the 18th district in the heart of the historic and multiethnic neighborhood. The artist also plans to give a talk about climate change to a group of schoolchildren. With Paris’ COP21 Climate Meeting just around the corner, Italian artist Andreco is welcoming the event with several public artworks. One of his designs is a large-scale mural that depicts his interpretation of man-made climate change and the alleged consequences. The art piece is painted on the facade of the Richomme Elementary School located in “La gout d’or,” the 18th district in the heart of the historic and multiethnic neighborhood. The artist also plans to give a talk about climate change to a group of schoolchildren.